Red Steel 2 released on March 23, 2010 as a Wii exclusive, that was also a WM+ exclusive title...meaning Red Steel 2 isn't/wasn't playable without a WM+ unit. Red Steel 2 released with a software only version of the game for $49.99, and a Wii MotionPlus bundled version for $59.99. Red Steel 2 saw its first price drop just 4 months after it released, in July 2010. 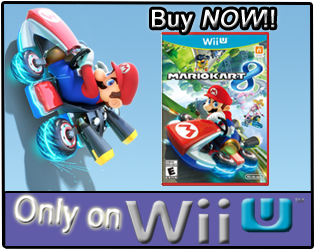 The MSRP for the software only version dropped from $49.99, down to $39.99; and the WM+ bundle dropped from $59.99, down to $49.99. The game has since seen another price drop, now with the regular version selling for $19.99, or less; and the WM+ bundle selling for $29.99, or less. 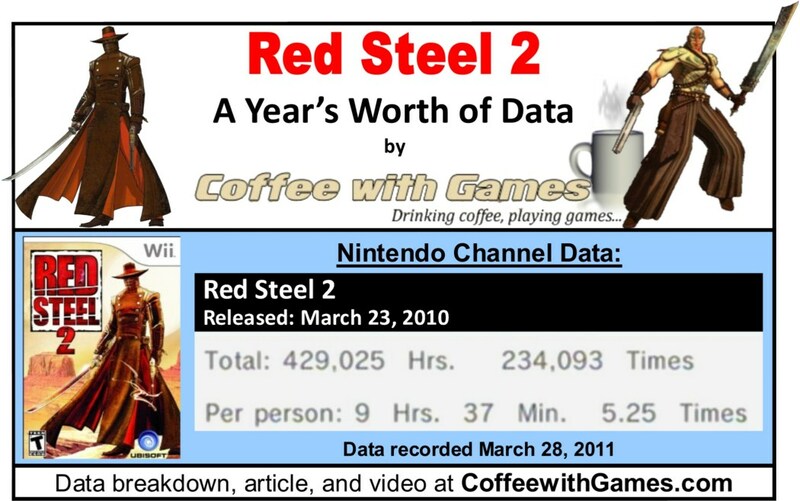 How many hours have Wii owners reported playing Red Steel 2 in the last year, with 371 days reported? Let's take a look! Hours shown are for United States of America Wii owners, not world-wide. 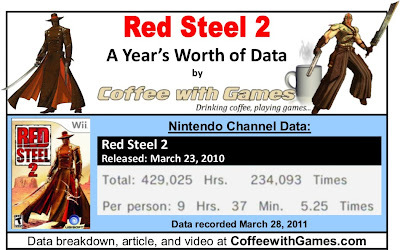 Red Steel 2 now has 44,589 Wii owners reporting game-play hours, through the Wii's Nintendo Channel. How many players has Red Steel 2 seen increased in reporting data since it first debuted in May 2010, and since the last report in December? Red Steel 2 has seen an increase of 37,782 players reporting data, since it first debuted in May; and Red Steel 2 has seen an increase of about 10,080 players reporting data, just since December 27. Red Steel 2 now has 429,025 Total Hours of game-play reported, an increase of 89,154 Total Hours since December 27; and it's an increase of 371,287 Total Hours since the game first debuted in May 2010. Red Steel 2's average play-time is now 9 Hours 37 Minutes "Per person" reporting data, which is a decrease of 14 minutes from the average recorded on December 27, but it's an increase of 1 Hour 7 Minutes more than the average "Per person" was when it first debuted. Red Steel 2's average play-time per session is now just over 1 Hour 49 Minutes. Red Steel 2's Amazon.com sale rank is #1,503, and it's currently listed for $16.47. Red Steel 2's Wii MotionPlus bundle Amazon.com sale rank is #3,172, and it is currently listed for $24.75 + 3.99 shipping from a third party vendor. Red Steel 2's "professional" review score average is 80.62%, based on 47 reviews on GameRankings.com. Red Steel 2 has a 4 out of 5 Stars rating on Amazon.com, based on 41 customer reviews for just the software version of the game; while the WM+ bundle for the game has a 4.5 out of 5 Stars rating based on 18 customer reviews. Red Steel 2's customer review score averages are 85.76%, when the reviews are converted to a 100% review scale. I still wonder why Red Steel 2 didn't include any sort of multi-player, though I know Jason Vandenberghe (creative director) stated the development team was concentrating on the game's single-player campaign, making sure it was solid. While concentrating on the game's single-player campaign perhaps helped initially with some decent reviews for the game early on, I think it was the fact the game only had a single-player campaign that kept it from selling better than it did. I know there have been several regular readers here that have commented things like Red Steel 2 was "lacking in content", and it had "an extremely short campaign, no replay value whatsoever". I think this word-of-mouth probably spread quickly about the game, and from the game-play data reported over the last year, it does appear that Wii owners are completing Red Steel 2 just once, and then moving on. While I still haven't played Red Steel 2, I am now in possession of a Wii MotionPlus unit of sorts...as I now own a Nyko Wand+ controller...so, perhaps one day soon, I will play Red Steel 2! Has this game crossed any of your radars recently? Also, have any of you tried Nyko's Wand+ controller with Red Steel 2, as well as the regular Wii MotionPlus unit? If so, could you tell the difference with input from the Wand+ controller compared to the regular WM+ unit; perhaps one being better than the other? It really is too bad... As time has gone on, I have begun to think that I am part of an older generation of gamer. As much fun as multiplayer is (and as much as I agree that it would have increased sales for Red Steel 2), I am just fine with a game that only has a solid single-player mode to offer. I guess that's why I enjoyed RS2! The mechanics were solid, the swordplay was visceral, and the gunplay was fluid. What more could I want from this type of game? Coffee, if you get the chance, I think it's worth your time to play through Red Steel 2. With 44,589 Wii owners RS2 had some pretty solid sales. Goldebeye sold over 1 million and has 49,117 Wii owners on Nintendo Channel reports. I don't know if we can say that RS2 sold 1 million as well, but by these numbers you can see that it definitely did well. I hope to see Red Steel 3 on the Wii 2. I think it would have been pretty difficult to offer a balanced multiplayer mode. After all, Red Steel 2 is an unconventional FPS-based sword fighting game. What would stop players from spamming special attacks and how would you prevent abuse of melee combat with the katana and long range combat with the guns? What kind of level design would be appropriate for the multiplayer maps ? How many players would it support? Red Steel 2 just was not ideally designed to support a multiplayer mode. Anyway,Red Steel 2 is a very good game and one of my personal favorite Wii titles. It's a shame that it didn't sell well. It most likely had to do with mandatory requirement of MotionPlus and to some extent, using the Red Steel name. The thing is, the concept of motion control-based swordplay has been the most wanted type of games from Wii owners. Before Red Steel 2 came out, we had only received a small taste of sword fighting in games like Twilight Princess, Red Steel 1 and No More Heroes 1 and 2. I did my 5th playthrough of Red Steel 2 back in January. I actually reviewed this game awhile back, and my feelings were that the game itself was a good play, and it can be found pretty cheaply now, but it did not take me long to beat and there wasn't much incentive for me personally to replay it, so I traded it in after. I agree w/ @anonymous that balancing multiplayer with this kind of game though would have been a tough job. For me though, without a branching storyline and no multiplayer, Red Steel 2 is more of a rental. I don't know if I expressed it here, but I was quite disappointed with Red Steel 2, as a fan of the first game. I've only played about 6 hours of Red Steel 2 myself, but it seems like I might have been a bit over half-way through the game. For me, multi-player didn't have anything to do with my time with each game; I touched the multi-player in Red Steel 2, maybe 3 times and not for more than 10 minutes. Where I really got my money's worth was from just playing through the single player again and again. I bet I've beaten it completely 3 times, and more than half way through twice more (once with Wiimote and Nunchuk in the opposite hands....tough, but interesting). I bought it about 1 month before they slashed the price. Now you can get it for $20 which I'd say isn't a hard sell, looking at how much other people seemed to enjoy it. @WesFX - I'll admit, I never played the first one, and other than some of the mechanics, I've heard that the first and second Red Steel games didn't have much in common, though based on reviews and comments I've read in the past, it seems like more people were impressed w/ Red Steel 2 overall - what was it about the first one you liked better? The controls likely weren't quite as precise since it was pre-Motion Plus - did you just like the story or some other mechanic more? I have no experience with the Nyco wiiM+ but I can say that Red Steel 2 is actually one of the best cases for Motion controlled gaming. It really was a showcase, but the rest of the game just didn't add up. I did really enjoy the gameplay and I would recommend it for sure. Primarily, more gunplay. Enemies start to block gun-fire pretty early in the game on the second difficulty level, so you're using your sword more often then your 4 guns. Ammo is scarce, so you avoid using up your guns in case you run across some of those Sheriff Stars that can only be collected with gun-fire or those flying robots that (I believe) you can't take out with your sword without hurting yourself. Red Steel 2 has a great visual style, but people didn't give Red Steel the credit I think it deserved for it's visuals. It is still IMO one of the best looking titles on the whole for the system, though I haven't played Black Ops or GoldenEye 007 which got credit for their visuals on Wii. The controls pale in comparison to almost all the serious efforts that came after it, but I think they absolutely work for what the game throws at you. I know people run across a seriously spastic reticule and I've seen the video to back it up, but it never happened to me (or not enough to make note of I guess), until after I had beaten it twice and someone mentioned it as a reason to not like the game. "Coffee, if you get the chance, I think it's worth your time to play through Red Steel 2." I still have a copy on reserved at GameStop...but because I picked up the Monster Hunter Tri demo, I ended up purchasing Monster Hunter Tri instead of Red Steel 2. So, I do want to play Red Steel 2, and hopefully once I fulfill/fail my New Year's resolution, I can get around to Red Steel 2. "Goldeneye sold over 1 million..."
Did Activision announce this? I would say based on the data reported, GoldenEye hasn't quite sold 1 million, at least in the United States, though world-wide it perhaps has. I just haven't seen any official sales figures for GoldenEye. 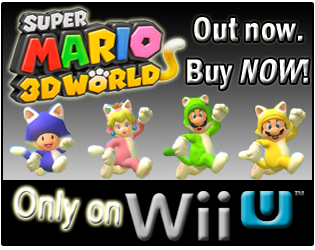 "I think it would have been pretty difficult to offer a balanced multiplayer mode. After all, Red Steel 2 is an unconventional FPS-based sword fighting game." Perhaps they could have included just a standard FPS multi-player mode though, and the single-player would have still kept the sword fighting mechanics? I think it would have been interesting if instead of one hit melee kills in multi-player(like most FPS games), they did like a pattern based attack, where the first player to correctly match the attack pattern won the battle...even with no multi-player, online leaderboards of some sort would have been nice. "For me though, without a branching storyline and no multiplayer, Red Steel 2 is more of a rental." See, that's something interesting...I really have to play this game. While the original didn't really have a branching storyline, it did allow for you to select missions of your own choosing at one point in the game, though it didn't effect(affect? English isn't my major!) anything. Red Steel also has two endings, which are based on a decision at the very end of the game. I believe you have to play through the entire game again to get the alternate ending, so there's not just a quick replay of the last level to see it. "Where I really got my money's worth was from just playing through the single player again and again." I know I've beaten the first one at least twice, and many of the levels more than that on replays. The graphical style in Red Steel 2 was definitely a change from the original, and with the setting of the game, it appears the graphics were done well. Hmmm, I only own the Nyko WM+, though my neighbor has mentioned I could borrow one of their units if I ever needed...I may have to do some comparative tests. "It is still IMO one of the best looking titles on the whole for the system, though I haven't played Black Ops or GoldenEye 007..."
Kind of interesting, I specifically thought of one Red Steel level, when I was playing through GoldenEye's single-player campaign, because the objects/setting in one area were very similar to that of one section in Red Steel. "The controls pale in comparison to almost all the serious efforts that came after it..."
Yea, I think if people just spend a little time with the game, and know that the controls aren't going to be silky smooth, they will adjust to the controls. I never had the spastic reticule, though I think I read it could be because of low battery issues. Thank you all for the comments and the discussion back/forth, I appreciate it! If anybody else discovers this post, and has feedback, please add it to the conversation!